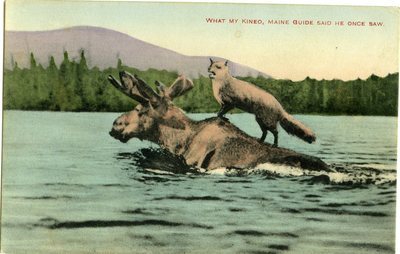 ""What My Kineo, Maine Guide Said He Once Saw" Postcard "
A postcard depicting a fox standing on the back of a moose while it swims in Moosehead Lake in Maine. Published by the Kineo Co., Kineo, Maine; printed in Germany. The postmark on the back of the image is from the year 1914.